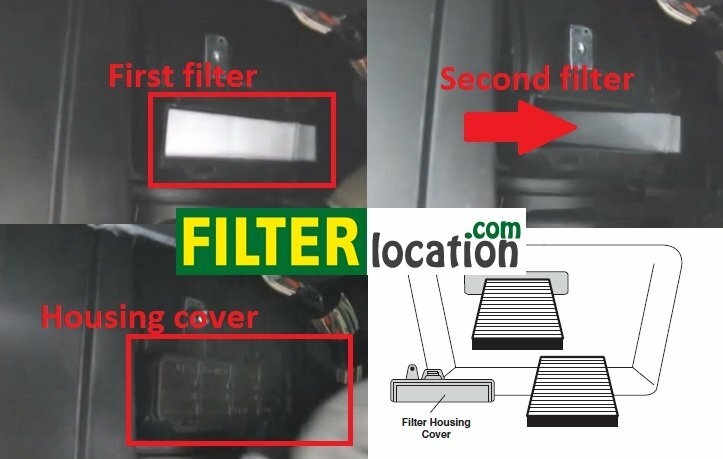 Suzuki Equator cabin air filter location. Where is located air conditioning filter on a Suzuki Equator. From year 2009 and 2010. Here you can find how to locate Suzuki Equator cabin filter when you need to replace. Air conditioner filter on Suzuki Equator is located inside of car behind the glove box. To replace cabin air filter on Suzuki Equator you need to follow the next steps. Open the passenger side door and then open glove box compartment. Push in on left and right side of glove box compartment to release glove compartment. After you do this you will be able to remove glove compartment. Remove bolt on filter housing cover. Remove filter housing cover by pushing up on tab. Suzuki Equator have to filter. First time remove first filter and then slide second filter to the left and then out. Replace the old Suzuki Equator cabin air filter hosing cover with the new one and reassemble all pieces back in reverse order. Why you need to change the Suzuki Equator cabin air filter? Is necessary to do this to protect your health and you passenger health. To this to remove odors, pollen allergy and other pathogens and pollutants. Is indicated to change the Suzuki Equator pollen filter each 12-15000 miles. For more guidance feel free to ask about how to replace the air conditioning filter for Suzuki Equator. How to locate if you need to change cabin air filter, oil filter, fuel filter, pollen filter or air filter on Suzuki Equator.